The field is set. 162 games are in the books. Three rounds of the postseason are done and over with. Two teams remain. This is the World Series. This is the Fall Classic. Let’s do this. Prediction Season continues here on The Greedy Pinstripes as we take the next step towards our yearly predictions by predicting the World Series. I have laid out the division winners, the Wild Card winners, and even went as far as to predict every win/loss record for all 30 MLB teams. I then went one step further and predicted the entire postseason for both the American League and the National League, and it has all come down to this. The 2018 World Series between the New York Yankees and the Washington Nationals. Can you imagine the ratings on FOX that we are going to see for this potentially epic series? The Yankees head into Washington as the road team for Game One since the Nationals will have home-field advantage throughout the World Series garnering all the attention that the young Baby Bombers should. Aaron Judge can be seen answering questions by reporters out in right field, Giancarlo Stanton can be seen doing the same in the dugout as we prepare for a game without a designated hitter. Luis Severino is out in the bullpen throwing to Gary Sanchez, while Didi Gregorius is signing autographs out by the third base visitor’s dugout. The stage is set. Bryce Harper is in the Nationals dugout being asked more questions about his plans for his impending free agency and whether he wants to play for the Yankees than he is the World Series at hand, but Bryce is answering those questions with political correctness and a swag unmatched by any impending free agent before him. The stage is set. These two teams are surprisingly evenly matched up at every turn. The Yankees may have a slight edge in starting pitching, especially if the team goes out and acquires a great starter in July like many expect them to while the likes of Severino, Masahiro Tanaka and Sonny Gray pitch to the backs of their baseball cards, and in the bullpen, although when Brandon Kintzler is your 7th inning guy it goes to show you how deep the Washington bullpen can be, but the offenses can both potentially be spectacular. How will the Yankees fare playing four games in a National League park while having to leave one of Aaron Judge, Giancarlo Stanton, Greg Bird, Aaron Hicks or Brett Gardner on the bench? Just fine, that’s how they will fare. The Yankees lineup is deep, powerful and intimidating from top to bottom. This team was built from within and is deep as they come offensively. This offense does not center around just one or two men, the entire lineup from top to bottom can beat you on any single pitch in any single game. There is potentially a different hero every night, which brings goosebumps to the skin just thinking about the possibility and the similarities to the Dynasty Yankees from the 90’s and 2000’s. 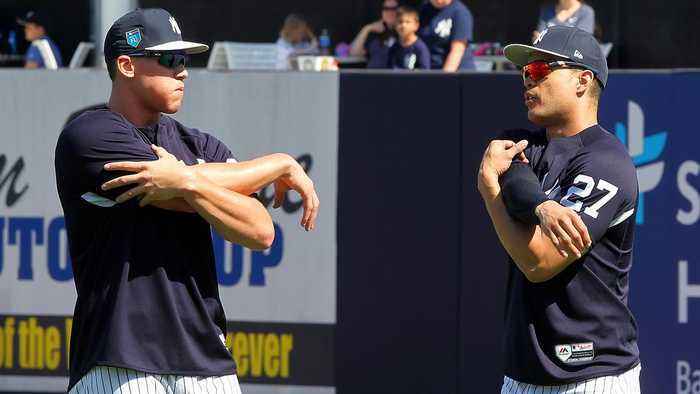 The Nationals are a good team, maybe even a great team, but this New York Yankees squad is just special. Period. Get off the tracks, the New York Yankees are coming. It may take all seven games, although I am leaning towards six games here to be honest, but the Yankees will be hoisting that World Series Championship trophy over their heads one more time, and that one more time is here in 2018.